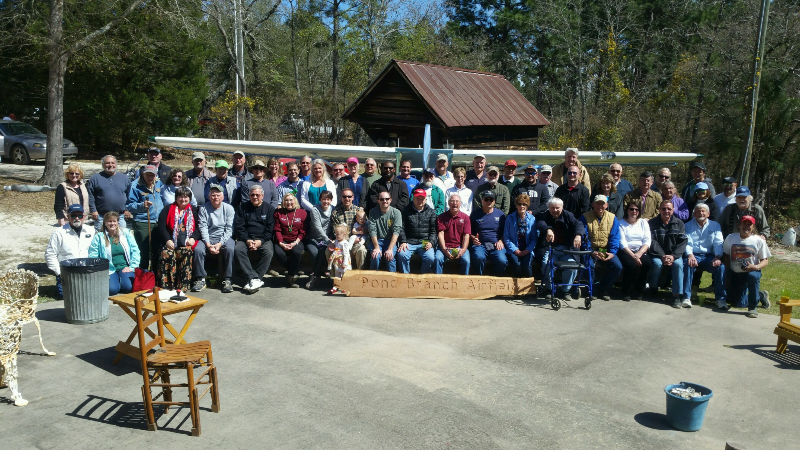 Our March meeting was held on Sunday, March 17, 2019 at Eddie and Sandy Price's Pond Branch Airfield (PBA). We enjoyed a bountiful and varied lunch of Beaufort Stew, hamburgers on the grill, and roasted oysters, along with a variety of delicious salads, rolls, slaw, vegetables, desserts and beverages. We served over 60 members and guests. Eleven planes flew in for the event. After everyone had eaten, we held a brief business meeting. President, Randy Berry, noted that we lost a valuable and beloved member and Treasurer of our chapter, Leon Strock, on March 9th, 2019. He then asked that we observe a minute of silence and prayer for Leon. Randy noted that if Leon were still on Earth, he'd have been right there with us today. Unfortunately, since Leon is gone, we found it necessary to elect another treasurer. Libby Berry was the only one nominated for the position, so she was unanimously voted as our Treasurer for the remainder of 2019. Randy also noted that the Sun-N-Fun Fly-in in Lakeland, Florida is coming up April 2 -7. Several members plan to attend. Randy also reminded everyone that ADS-B Out will be required to enter any controlled airspace beginning January 1st. 2020, only about 9 1/2 months away. He then asked those attending if they had fun and enough to eat to which all gave an enthusiastic "YES". The meeting was then adjourned. For photos of the event from Eddie Price, click on the group photo above.